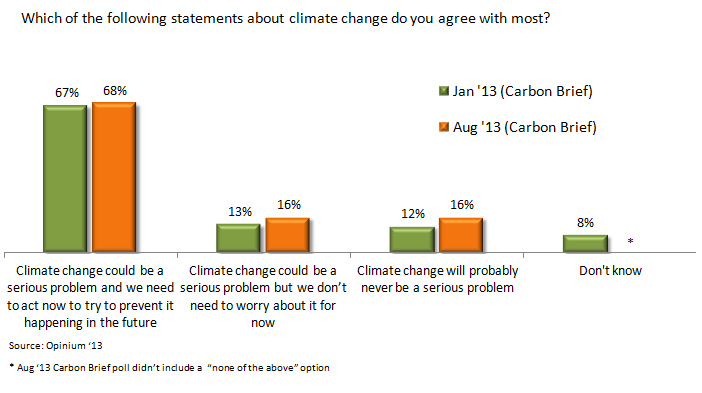 The claim that climate change has paused has had a great few months in terms of media coverage – but Carbon Brief’s new poll suggests this hasn’t had any impact on public opinion. The climate change ‘pause’* – the suggestion that global warming has stopped over the last 16 years – has had plenty of attention recently. Andrew Neil’s interview last month with the Energy & Climate Change Secretary Ed Davey began, “can global warming be happening as expected if the world has stopped getting hotter?”; the Mail have been talking about it for months; and some respected climate scientists have joined the debate. If there was an organised campaign to change the debate about global warming – so it’s seen as something that’s uncertain rather than already started – it would look to be doing well. But getting a lot of coverage is only a start. Squeaky bum time for any campaign comes when the funders ask to see what the impact of all the coverage has been. This is where a ‘climate change has stopped’ campaign that was aiming to change the wider debate about climate change would struggle. Because, despite the attention it’s had, almost no-one can remember hearing it, and overall opinion about climate change essentially hasn’t moved over the last seven months, when coverage has been at its highest. 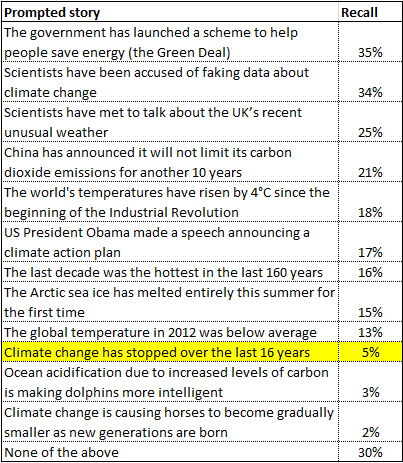 Carbon Brief asked respondents to say which news stories they could remember hearing, from a list of real and made-up stories. The most frequently recalled were the Green Deal, stories about scientists faking data (higher than I expected), and scientists meeting to talk about the UK’s recent unusual weather. The story that climate change has stopped over the last 16 years was recalled by just one in 20 people: less than a quarter of the number who thought they recalled a made-up story about China announcing it won’t limit its emissions. Another question on views about climate change also suggests that the debate hasn’t had a measurable impact on public opinion. Despite the media coverage of the supposed pause, there’s been no significant change in the numbers who think climate change requires action now, and the numbers who don’t. None of this is to say that climate sensitivity doesn’t need to be better understood, or that the public and policymakers shouldn’t hear about and discuss these issues. But it’s important for all of those in the debate to remember that, most of the time, however big your platform is, and however loudly you shout, almost no-one notices or cares as much as you – or the people you’re arguing with – do. * I don’t really talk about climate science in this blog, but there’s plenty of good analysis of the debate, for example here or here. This entry was posted on Thursday, August 22nd, 2013 at 12:12	and is filed under Climate Sock. You can follow any responses to this entry through the RSS 2.0 feed. Both comments and pings are currently closed.